Back to School shopping is always so much fun with the kids. I am super pumped about all the awesome deals that we have been able to score this year! Check out these NEW coupons from Famous Footwear. 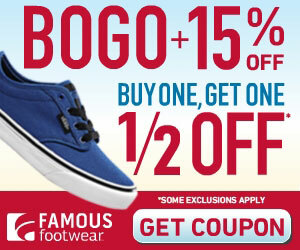 Grab the Buy one get one Famous Footwear Coupon and shop today. In addition, there's also an 15%-20% off coupon too.